It's beginning to look a lot like Christmas on getTV, as the network celebrates the season with its second annual "The Most Wonderful Month of the Year" event. The channel turns over its daily schedule during primetime all month long in order to focus on a mixture of rare and classic Christmas-themed variety specials, TV series episodes, and films, starring some of entertainment's biggest names, from Sunday, November 27 through Sunday, December 25, culminating in a week-long 24-hour-a-day yuletide mega-marathon kicking off at 12 noon on Sunday, December 18 and running through Christmas day. The event launches at the tail end of the Thanksgiving weekend at 7:50 p.m. ET on Sunday, November 27 with getTV's network premiere of 1998's The Christmas Wish starring Neil Patrick Harris as a young man who sets out to grant his grandmother's (Debbie Reynolds) wish in The Christmas Wish, which also features an early appearance by Naomi Watts. Other highlights of note to us include, Tuesday evenings will highlight back-to-back holiday episodes of getTV's latest acquisitions, The Jeff Foxworthy Show, co-starring Haley Joel Osment, and The Bill Engvall Show, co-starring Jennifer Lawrence, followed each week by a classic Christmas film. And Wednesdays, as part of the channel's "Get Lost in TV" block, will feature Christmas-specific episodes of rare and classic television series, including a unique evening of 'action/crime' Christmas episodes from The Equalizer, Hardcastle and McCormick, Riptide and more (Nov. 30), an evening of yuletide Westerns featuring The Restless Gun, Cimarron City, The Tall Man and more (Dec. 7) and a night featuring back-to-back holiday hours of In the Heat of the Night (Dec. 14). CW Seed has added two series to its streaming line-up. 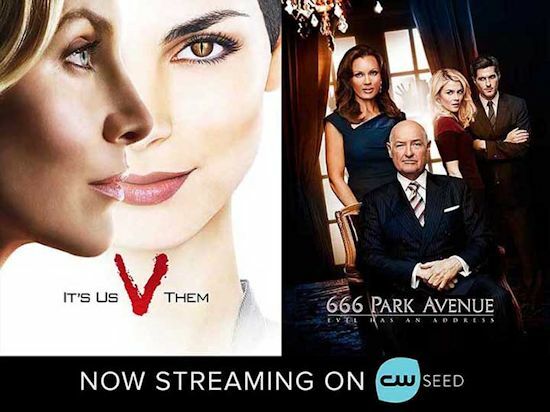 Two former ABC series: 666 Park Avenue and V. Both series are available now on CW Seed, with all 13 episodes of 666 Park Avenue. The drama starred Rachael Taylor, Dave Annable, Vanessa Williams, and Terry O'Quinn and followed a couple who learned that the Manhattan apartment building that they just moved into, including its upscale tenants, might have been possessed by a mysterious demonic force. The series aired in 2012-13 on ABC. CW Seed has the first season of ABC's V revival available right now, which is the full 12 episode first season. The revival chronicled the arrival on Earth of a technologically-advanced alien species which ostensibly came in peace, but actually had sinister motives. The series starred Elizabeth Mitchell and Morena Baccarin, with other stars like Morris Chestnut, Joel Gretsch, Laura Vandervoort, Charles Mesure and Scott Wolf.